Well, it’s still a construction site, and trains – apart from the contractors’ ones - won’t rumble through here until 2018, but it’s safe to predict that the new Canary Wharf Crossrail station with its Foster superstructure will be not a patch on Foster’s nearby Canary Wharf Jubilee Line station as a travelling experience, and for one good reason: commerce. But it will offer other experiences. In the Jubilee Line station of 1999 there is that famous and enormous cathedral-like space leading from the depths to the surface. Pure air. In the case of Crossrail the equivalent space will be stuffed with four levels of retail, two above ground, two below. This is an oversite development that in its way is no different from any other being proposed and built for Crossrail’s Central London stations. So it makes no difference that the platform level is huge in area terms, those platforms being a stonking 240m long, capable of taking 12-car trains. There’s a concrete slab above your head here, and another in the ticket hall above. Well-finished though these areas will be (and in places already are) with their tough, well-thought-through Grimshaw-designed interiors, there is no attempt to connect the subterranean visually with the surface. Unless you count the bright yellow glazed sides to the escalators. The landscaping goes in. Now for the trees. One of hundreds of different connection nodes. Central London is that way. Yellow-sided escalators up from platform level. Because big civil engineering is always fun, it was exciting to get down there, stand on that long, long island platform and stare into the tunnel at the end. Crossrail is huge infrastructural step forward for London that has also unleashed a huge amount of ground-level development as it passes through the city. 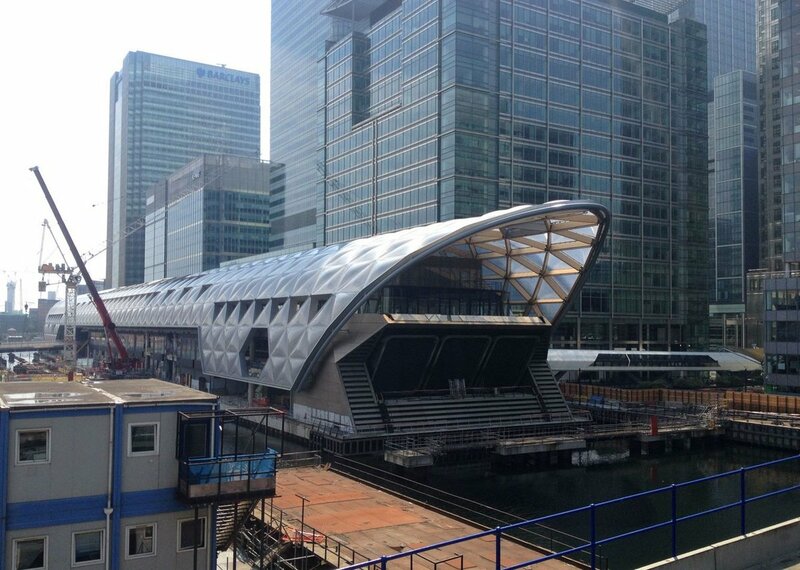 Here at Canary Wharf, however, things are a little different. For a start, the station development is expressed as a vessel floating in the dock, even though in fact it plunges 28m below water level. Water is kept all round – the dock reduced to a broad navigable canal on the north side, complete with lifting bridges, while the narrower gap between it and the water’s edge to the south becomes a flood reservoir, designed to look pretty with water cascades but to fill to the brim in times of deluge. 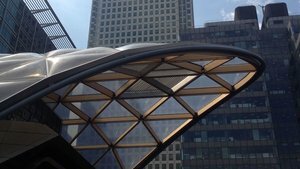 The final cleverness of the building is the way it skilfully incorporates the two kinds of vent shafts demanded by Crossrail – one to do with air changes down below, the other handling the air displaced by train movements. Obviously these vents couldn’t poke through that latticework roof. So Foster’s project partner Ben Scott and his team have ingeniously incorporated them into the podium of the building, just above the waterline but beneath the hooded ends of the canopies. Although it might not look like it, this building is also seen as a ‘stepping stone’ to the north – in other words to and from real, old London rather than the financial and retail centre it is tethered to. Key to this is the public garden on the roof. Scott waxes lyrical about his timber-diagrid structure with its pillows of ETFE foil, not so different to Grimshaw’s Eden Project but arranged to a very different geometry. There are, he says, 550 metal nodes joining all the spars, 360 of which are unique. This is a wholly-bespoke superstructure. Go up there and – though the trees aren’t in yet – the bones of the Gillespie-designed landscape are fast becoming apparent. It’s a botanical glasshouse, though with sections removed from the roof to allow tree canopies to burst through. Despite that, it will be able to house species similar to the Temperate House at Kew, says Scott. And it will apparently be open to all, round the clock. In fact this garden takes up slightly more than a third of the building footprint, the remaining two thirds being large pavilions at either end – one for a huge restaurant, the other for as-yet-undisclosed community use. The gardens are big, but I’d imagined them as bigger. I’ll reserve judgment until the building is complete. Because my departure took me through the Foster Jubilee Line station. And as I descended those escalators through epic space, I wondered if we’ll ever see ambition on that scale in such a public project again.